Buena Onda Surf Project Fundraising Fiesta This Evening! - Yo! Venice! Home Abbot Kinney Blvd Buena Onda Surf Project Fundraising Fiesta This Evening! Buena Onda Surf Project Fundraising Fiesta This Evening! 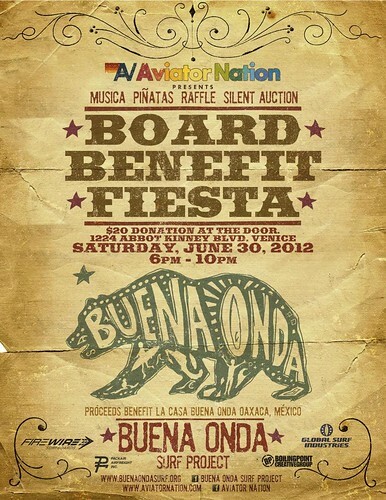 The Buena Onda Surf Project, a bi-national organization creating positive change through surfing for deserving kids from the coastal communities of Oaxaca, México, is having a “board benefit fiesta” this evening from 6-10pm at Aviator Nation on Abbot Kinney. The event will feature drinks, music, piñatas, a raffle and silent auction. Proceeds will benefit the purchase and shipment of 20 surfboards and other goods to equip La Casa Buena Onda in Oaxaca. A $20 donation is requested at the door. Peep the Buena Onda Surf Project website to see what they are all about!